I don’t understand why five certain MLB teams had to do big time business on Opening Night and Day. Aren’t you busy watching your team, or getting prepared for the first game? Why must you complete a blockbuster trade? The trade I’m referring to went through Sunday night, just an hour or so before Cardinals-Cubs was about to get underway. My first reaction here was “Holy Preller”. A.J. Preller has came into San Diego and has completely shifted their franchise. I’ve covered it and predicted their season already. This is only another huge boost. Craig Kimbrel is the best closer in baseball. Last year, he had 47 saves, leading the NL. He’s still young, debuting only four seasons ago. Since he’s a closer, it’s hard to project him, but the Padres only add stability in their bullpen, which rounds out one of the best pitching staffs in baseball. Kimbrel is a strikeout machine, KO’ing 95 batters in 61.2 innings last year. Though I love the trade for Kimbrel, I’m not sure I like the Padres picking up Melvin Upton. Notice where Melvin is? As we know, justin Upton was traded to the Padres earlier in the offseason, and he starts in left along with Matt Kemp and Wil Meyers. Melvin is an outfielder, so he’ll find himself on the bench. The meme is still great though. 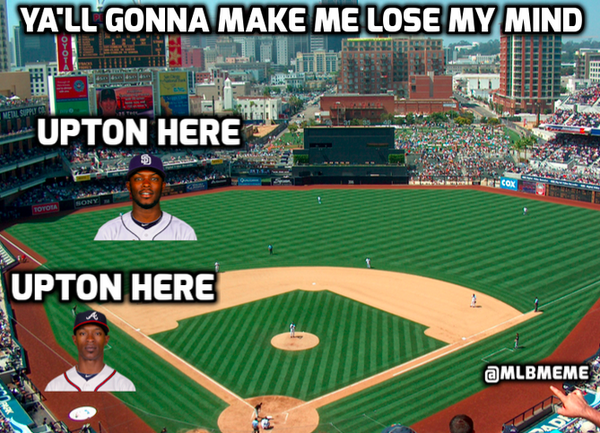 As for the baseball side of acquiring Upton, he’ll probably be an off the bench guy, who’ll play utility. Since Matt Kemp is quite injury prone, it’s likely Melvin will see some time starting. Melvin’s contracts huge, as he is owed $46 million over the next three years. Upton had majorly disappointed the Braves since signing it. Atlanta seemed desperate to find a taker for Upton, and it ended up costing them their best closer. That’s how bad they wanted to get rid of him. Atlanta clears a ton of money with this deal, and it sets the stage for the rebuild that’s already in progress. With what the Braves got back, I mean, wow, how did they get away with this? San Diego gave them a ton of players, including a young pitcher who is promising. Carlos Quentin had been with the Padres the past three seasons, being a major liability. He’s always hurt, and led the majors in hit by pitches in 2012. Whether you consider that a good thing is your decision. Quentin has always been a bit of a pinball, so it’s not a surprise he got moved. Cameron Maybin also got sent to the Braves. Maybin has been great when healthy throughout his career, but has never had the huge season. He’s played in 100 games once in nine years. San Diego gave up on him, since he’s already 28. Maybin has played in 33% of the Padres games the past two seasons. That’s, not great. The Braves might get something out of him. I mean, I’d bet on his defense to improve in centerfield. His DRS (Defensive Runs Saved) has been down lately. Whether the projection agrees, if I’m Atlanta, that’s all I want. Matt Wisler is a nice prospect that got sent to Atlanta in the deal. Ranked No.70 on MLB.com’s Prospect Watch, Wisler is a strikeout fed pitcher, who relies on them quite much. His ERA is a tad high, along with his WHIP. Those can be worked out, but with a record of 9-5 in Triple A this year, his team is helping him out a bit. Wisler has time, and so do the Braves. This could work out quite well. I don’t know much about Jordan Paroubeck, but as another young prospect, the Braves have some solid guys in their farm system. The trade overall helps San Diego big time in the short term. After Preller came in, he completely rebuilt this team, and this happened to be one of the final pieces, just hours before the MLB’s first game of the season. After last year’s Cy Young season, Corey Kluber got locked up by the Indians. Cleveland’s ace got basically a five year, $38.5 million extension, with the possibility of incentives dragging the price up to $77 million. The money was a lot lower than I expected, giving what Rick Porcello got (more on that later). Perhaps the Indians know Kluber is older, and has a higher risk of getting injured. It’s more about him willing to take less money to win, though staying Cleveland as a city ain’t great. With last year’s Cy Young winner locked up, Cleveland is ready to win. This team is super good this year, and will only get better. Having your best guy under contract helps. I’ve always liked Rick Porcello as a pitcher. He’s young, and is a solid rotation guy, who’ll probably end up being a No.3 or No.4 with Boston. The Red Sox locked him up to a four year, $82.5 million contract on Opening Day. Boston needs solid pitching after losing many of their key guys from the last couple seasons. The money was huge, more than Kluber. Though, it is the Red Sox, so they have that type of money to spend. Giving Porcello the money now is better than giving it to him later. He’s only 26, and has a bright future. There aren’t many restrictions within his contract, allowing the Red Sox to deal him if necessary. That out come isn’t a likely one, as the Red Sox see Porcello as one of the key guys for their future plans. Just this afternoon, the Pirates locked up third baseman Josh Harrison. The contract was for four years, and was worth $27.3 million. Harrison had a monster season last year, hitting 13 HRs and boasting an outstanding OPS of .837. It was Harrison’s breakout year, as he had spent the past three years with the Pirates. He’s known for his power, and is a hassle on offense to pitch to. The money isn’t huge, which was smart of Pittsburgh. Though he had a huge season, it’s his only good year as a player. It seems that they might have jumped the gun on him, and it might back fire. I like Harrison. He’s a great hitter who excels at getting on base. Though, I’m just worried the Pirates threw the money at him a little too early. Couple observations from the first two days of the baseball season…. Rough start for Mat Latos in his Marlins debut. Made it 2/3 of an inning and gave up seven runs. He had a lot of trouble keeping the ball above the waist of his batter. We’re two days into the season, and I’m really excited about my fantasy baseball team.